Read the script for your students, or play the listening file that is included for them. Students listen to each sentence and write what they hear in the target language, doing their best with spelling. After they are done listening, students go back and illustrate the meaning of each sentence. Great for your artistic students and a quick sub plan or activity to practice the targeted structure! Ideas for an extension activity are included as well. 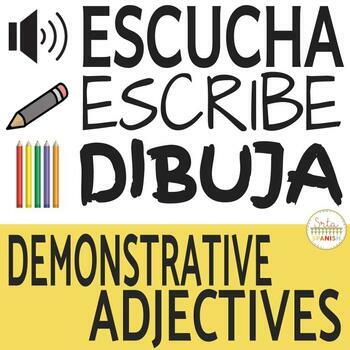 Check out my other products to practice Demonstrative Adjectives! •	Look for the green star near the top of any page within my store and click it to become a follower. You will then receive customized email updates about this store!